A New Map of The North Part of Antient Africa Shewing the Chiefe People, Cities, Towns, Rivers, Mountains, etc. in Mauritania, Numidia, Africa Propia, Libya Propia, and Egypt. 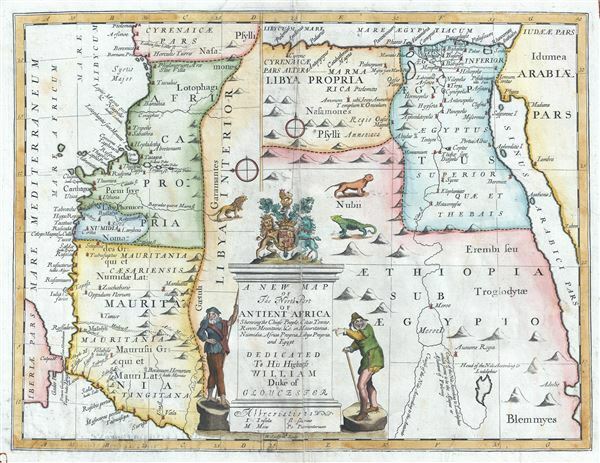 This is an uncommon and beautiful 1712 map of the northern part of Africa in ancient times by Edward Wells of Oxford. This interesting map depicts the northern coastlines of Africa with an unusual orientation, with the eastern part of the coastline from Morocco to Cyrenaicae (Libya) featured on the left half of the map oriented to the east and western parts of the coastline from Libya to the Red Sea featured on the right side of the map oriented to the north. Throughout, the map notes several towns, cities, rivers, mountains and other topographical features. Many ancient cities are identified, including Thebes, Memphis, Babylon, Meroe and others. After having passed through this country in the forty days which I have said, you will embark again in another vessel and sail for twelve days; and after this you will come to a great city called Meroe. This city is said to be the mother-city of all the other Ethiopians: and they who dwell in it reverence of the gods Zeus and Dionysos alone, and these they greatly honour; and they have an Oracle of Zeus established, and make warlike marches whensoever this god commands them by prophesyings and to whatsoever place he commands. .Several archeological surveys have been undertaken to unearth the labyrinth, but so far no findings have been confirmed. A large title cartouche is included in the bottom of the map featuring two men and the coat of arms of the Duke of Gloucester, a lion, a lizard and another animal. This, like many other Wells maps, is dedicated to Prince William, Duke of Gloucester and son of Queen Anne, who, when this map was being prepared, was a student at Oxford. Engraved by R. Spofforth and published by T. Bonwicke for the 1712 edition of Edward Wells' Atlas, A New Sett of Maps both of Ancient and Present Geography.